Disney, Activision Blizzard, and TripAdvisor investors could see elevated volatility in their stocks over the next few days. 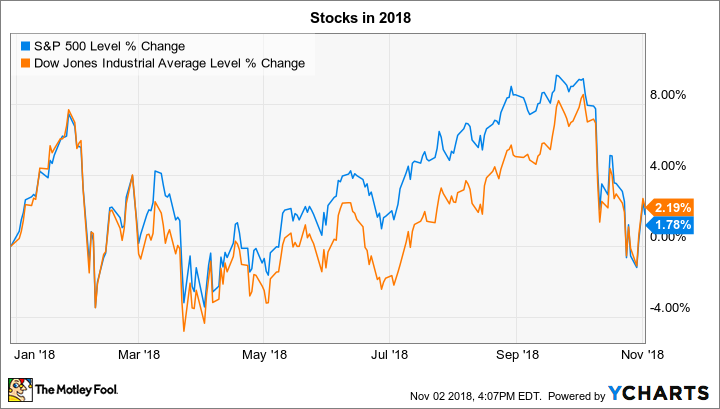 Stocks rose last week, with both the S&P 500 (SNPINDEX:^GSPC) and the Dow Jones Industrial Average (DJINDICES:^DJI) gaining just over 2% as investors reacted to generally positive earnings and economic reports. Yet that boost erased only some of the decline from the previous week to leave indexes just slightly higher so far on the year. Earnings reports continue to flood in. Below we'll take a closer look at the announcements that could send shares of Activision Blizzard (NASDAQ:ATVI), Disney (NYSE:DIS), and TripAdvisor (NASDAQ:TRIP) moving in the trading week ahead. Investors are looking forward to hearing from Disney on Thursday. The media giant's last report contained plenty of good news, including booming results from its movie and parks divisions. Advances in these segments should be enough to return the company to growth in fiscal 2018, after a rare decline last year. They'll also figure prominently in any outlook comments that CEO Bob Iger and his team make for the new fiscal year, since Disney's movie-release plans are likely firm for the next few quarters. Disney should also share details about its struggling media segment on Thursday. That division has posted weak growth and reduced profits this year as consumers shift their consumption away from the broadcast TV ecosystem. Yet the company noted a slowdown in subscriber losses last quarter, and if the trend continued over the last few months it would be a positive development for the business. Finally, keep an eye on streaming updates for Disney's new ESPN app: Its success (or stumbles) will tell investors a lot about Disney's chances to successfully pivot toward offering its own subscriber-based content, outside of the traditional cable-TV model it has relied on for decades. Activision Blizzard posts its latest numbers on Thursday; although the video game developer has many hit global franchises, attention for this report will be focused on the Call of Duty brand. That franchise has delivered the top-selling title in nearly all the last eight years. Its path to the top of the sales charts might be even easier this year, too, considering stumbles by rival Electronic Arts in its competing Battlefield V game release. Looking beyond just the holiday-season results, investors will want to see evidence that Activision is taking full advantage of the shift toward digital spending in the industry. This could, for example, involve releasing a flood of content through the company's e-commerce channel and offering more season-pass options. Digital sales are raising Activision's profit margin, since they cut out middleman retailers. But the even better news for investors is that they're turning games into a subscription-type service rather than a one-off purchase. That shift promises to benefit game-development companies that can consistently produce high-quality gaming experiences. TripAdvisor shares have dramatically outperformed the market this year -- and for good reasons. After a tough operating stretch in 2017, the online travel-booking site has managed to turn its profitability higher in recent quarters, mainly by becoming more efficient in its marketing spending. Those shifting priorities have put pressure on TripAdvisor's core hotel booking business, and so investors are hoping to see that business improve on the 4% decline it reported in the second quarter. Meanwhile, the company has an exciting long-term opportunity to build a large attraction-booking business. Look for CEO Steve Kaufer to spend some time on Thursday's conference call discussing that initiative. For the stock to keep up its winning ways, though, TripAdvisor will need to keep showing progress in its rebound plan, as investors hope to see a third-straight upgrade to its 2018 earnings outlook.